There are a variety of mediums that you can use to finish a painting, but none provide as lustrous or vibrant a piece as a resin-pour. With a level surface, the right materials, and some patience, you can watch the colours of your piece burst to life under the resin coating. You can coat just about any material, including acrylics, oils, and watercolours. 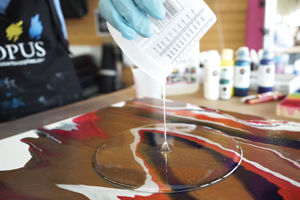 If you’re coating a material that you are concerned might bleed, consider pre-sealing your piece prior to adding the resin. Eli-Chem, the producer of our new brand of fully archival, non-toxic resin, offer an online coverage calculator. Use this handy online tool to determine how much resin you will need to use for a single coat: elichem.co.uk/coverage-calculator. Resin is amazing on its own, and you can add to the material to create even more stunning effects. 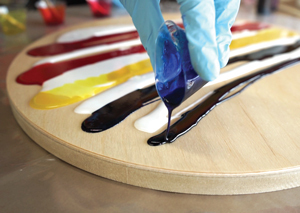 You can add colour to your resin quite easily, using fluid or high-flow acrylics, or dry pigments. 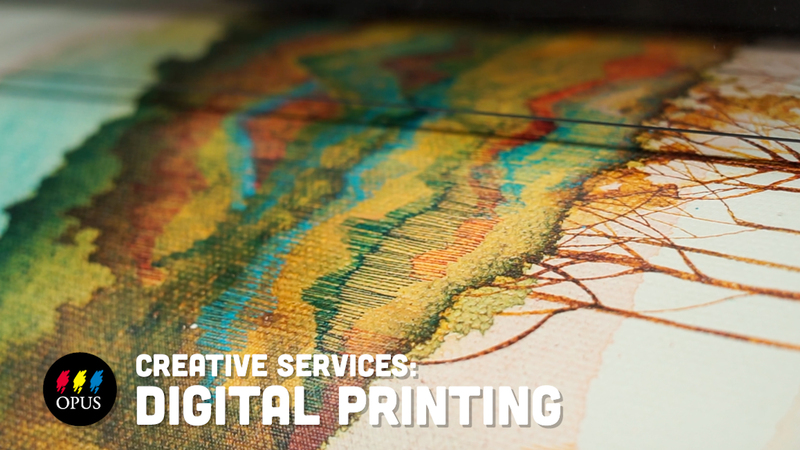 Play around with colour opacity, or with shimmering & pearlescent colours, for additional options. Regardless of the brand, be sure to use artist-grade pigments when tinting your resin. 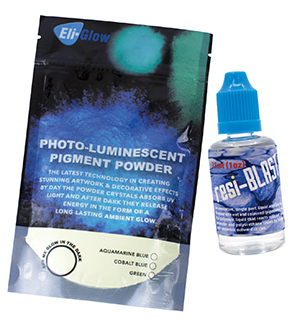 Try Eli-Chem’s Photo-Luminescent Pigment Powder, and give your piece a whole new look as it glows in the dark for several hours. In addition to adding colour, you can create stunning effects by suspending pieces of material in your resin layer(s), such as gold flakes, dried flowers, found objects, and more. You can also be selective about where you choose to include resin in your piece. Bring attention to specific parts of your piece by embellishing details, such as water droplets on a leaf, or shiny accents in an abstract piece. By adding more than one coat of resin, you can build your artwork up with layers, creating shadows under your paint, and giving the 2D layers the illusion of extrusion. 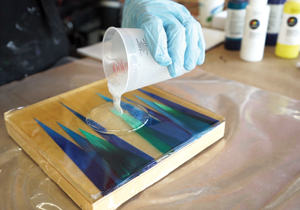 Let each layer of resin dry before adding your artwork. You can paint, draw with paint markers, add paper cut outs, collage, or leave objects in between layers. Start with an existing piece to add some visual pop, or pour directly onto your surface to levitate your artwork from the get-go. You don’t have to cover an existing piece of work when you can make your work out of the resin. Simply measure out the two parts and create your resin mix, then divide the mixture into containers, one for every colour you’d like to use. Mix in your desired pigments, and pour onto a rigid surface! As the colours mix and dry, you’ll notice lighter pigments come to the surface, and heavier ones sink to the bottom. One of the trademark looks that artists strive for when pouring is the dispersion of pigments to create cells. You can encourage these cells in your pours by using resi-BLAST; pour it into the sections where you would like to disperse the pigments further. Did we whet your appetite for resin pouring? Get into the nitty gritty details with demonstrators Camille and Erin in our latest how-to video above, Introduction to Resin Pouring. Discover how to get rid of unwanted bubbles, mix pigments into your resin, and the preferred method for layering. With stunning visuals and entertaining, easy-to-follow dialogue, you’ll get their insight on techniques, recipes, tips, and be ready to pour in no time. Take it further: for your first or next project, try using a mold for your resin or coating a piece of furniture! INSTRUCTION SHEETS Check out these technique sheets with step-by-step written instructions from Opus staff & artists Camille and Erin, along with full material lists for each technique. • Measure the parts of resin carefully; changing the ratio will negatively impact the mechanical properties, and effect ability to cure properly. • Stir the components thoroughly, but take care not to stir too fast; this may result in too many bubbles in your mixture. Make sure you get into the corners of your mixing container and scrape the sides, too. • The temperature of your studio or room will influence drying times. Eli-Chem recommends a 23°C room temperature. • Cover your piece while it dries, to protect it and keep dust, insects, and other debris out of your resin coat. • If your artwork is on a large canvas, reinforce the backing with cardboard to prevent the resin from pooling in the centre. • You can place containers of resin and hardener into warm water before mixing (with caps closed shut) to help reduce bubbles.